White Rabbit’s four decks shown in the plans above indicate how well the owner utilizes all available space. Starting on the sun deck aft (1) there is al heli port where an ultra-light sea plane, amphibious car and Pursuit tender are stored. Forward is a circular Jacuzzi and a spa bath (2). Below is the boat deck and the yacht’s primary entertainment and conference centre (3). The galley (4) is also on the boat deck amidships behind the wheelhouse (5). 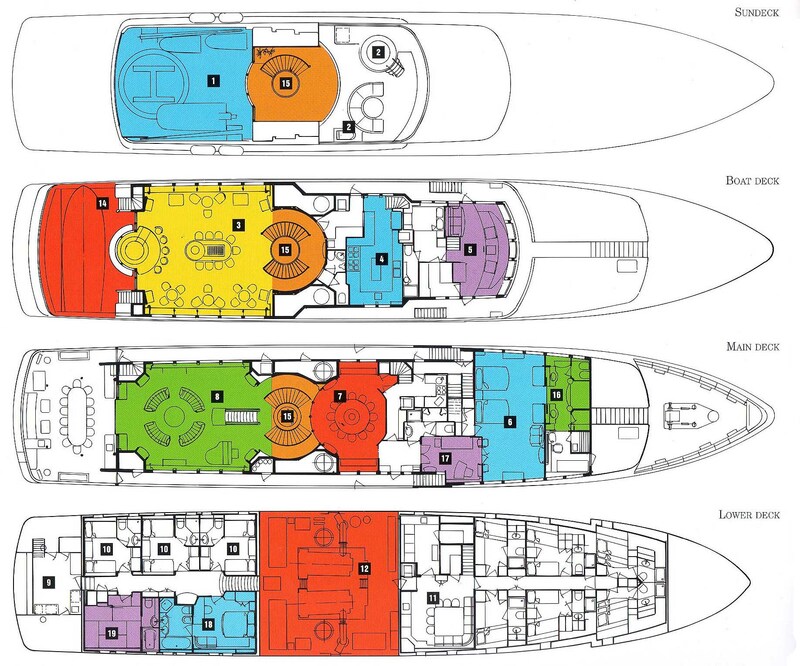 The main deck is dedicated to the owner’s private suite (6) forward, the dining room (7) and the main lounge (8). An extensive aft peak (9) complete with fishing and diving equipment providing direct access to the yacht’s guest accommodations on the lower deck (10). The crew’s mess (11) and quarters are forward of the engine room (12).